It is quite axiomatic that a large-scale regime transition is occurring with respect to the status of the tropical Pacific. The precursor, La-Nina-esque modality seen during the cold season of 2017-18 is now beginning to demonstrate signs of integral alterations. Rapidly warming subsurface water temperatures in the tropical Pacific augur a diminution in the slope of the thermocline, such that warmer waters will gradually propagate eastward. Changes in the sea surface temperature anomaly (SSTA) profile in the Indian Ocean are suggestive of a more positive Indian Ocean Dipole (IOD), again, portending an oncoming El Nino event. Convectively-coupled kelvin waves, and westerly wind bursts will eventually make more eastward progress by mid-late summer. However, atmospherically speaking, the angular momentum budget is still rather reflective of lingering vestiges of La Nina, given low-orbit GWO cycling, and somewhat Nina-esque tropical forcing. The actual Oceanic-Nino-Index (ONI) will turn warm-neutral for the summer, but an official weak El Nino may not initiate until late summer. Atmospherically, countervailing forcing mechanisms should elicit a highly capricious pattern in the northern tier, with oscillating periods of cool and potent heat. The provenance of this oscillatory pattern, as noted, is the step-wise progression from La Nina into El Nino both atmospherically and oceanically, tropically, and extra-tropically. The most preeminent variables that will dictate the United States weather pattern include the Pacific, Atlantic, and tropical Pacific modes, with lesser influence, though some input derived from polar indices such as the East Pacific Oscillation (EPO) and North Atlantic Oscillation (NAO). The expectation for these factors; thus, will govern temperature and precipitation departures, as delineated herein. 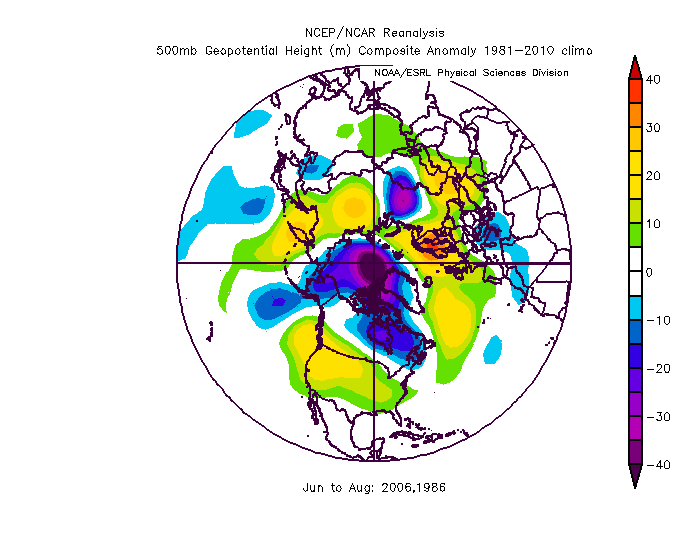 As elucidated heretofore, the transitioning IOD, ENSO states, coincident with a rising PDO, and falling AMO will have implications on the resultant z500 geopotential height pattern hemispherically. The warmer water relative to normal in the eastern Pacific will induce a predilection for maintenance of ridging in the Western US. Furthermore, the anomalous warm pool in the central Atlantic Ocean will, also, tend to induce a feedback loop of higher geopotential heights, strengthening the offshore, and “West Atlantic Ridge” (WAR) feature. This will expand westward and connect with the Western ridge for at least a few week period during the summer. 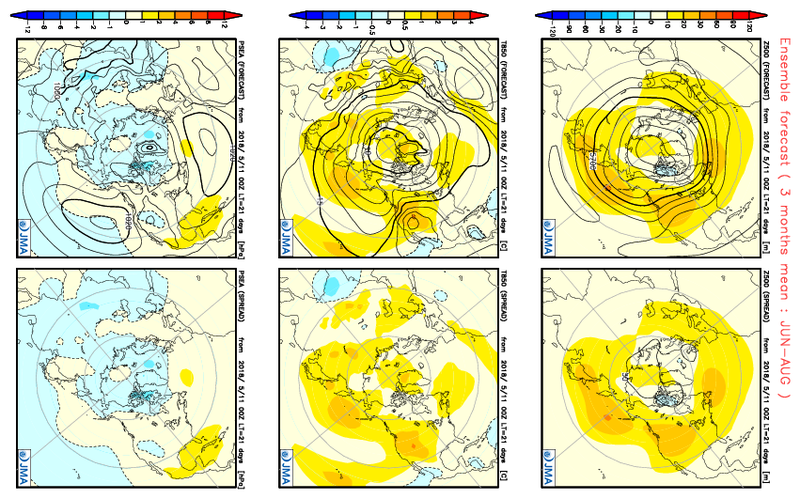 Below is the June-July-August JMA forecast simulation for the 500mb, surface pressure, and surface temperature pattern. It indicates a mean ridge in the Western US, and slightly lower heights in the Northeast. The years that featured the most commonalities with the present atmospheric and oceanic patterns were 1986, and 2006. The composite, temperature and precipitation for those years is as follows. The etiologic factors related to this resultant summer outlook were covered in the foregoing discussion. The progression sensible weather wise should be as follows. 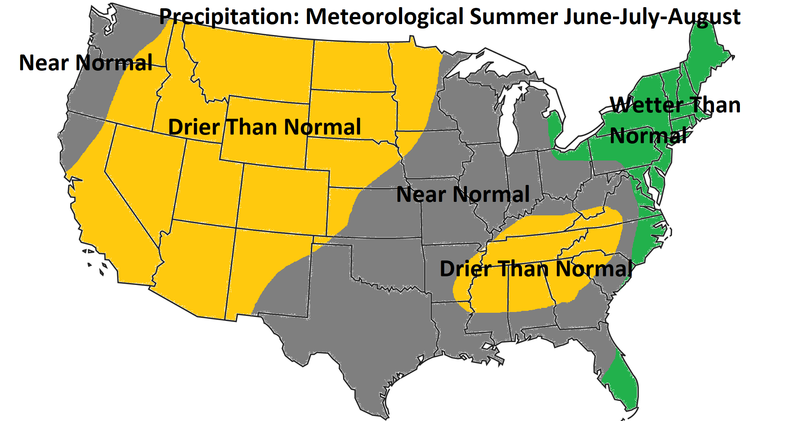 Early summer – particularly the first half of June – will feature a propensity for enhanced troughiness over the Great Lakes and New England; concordantly, an east-west ridge will develop across the United States. Northwesterly flow aloft should dominate the pattern in the Lakes/Northeast. Eventually, by the second half of June, more ridging will extend eastward, and the West Atlantic Ridge should retrograde later in June into July. 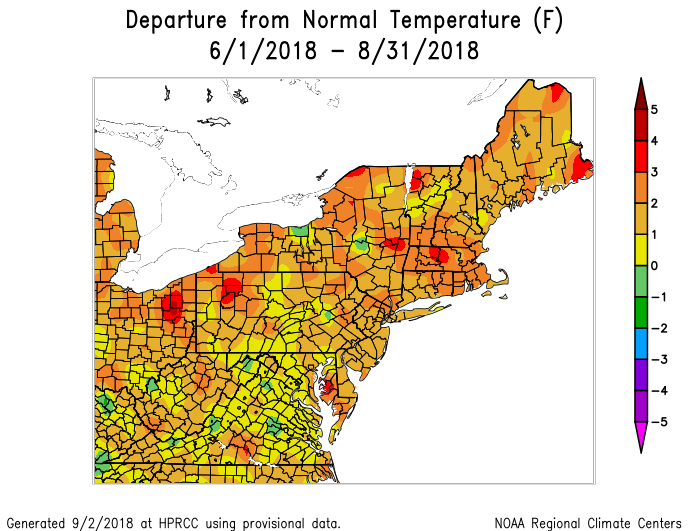 July may feature at least 2 weeks of very hot weather in the Northeast, relative to normal, with a significant heat wave, as the ridges connect. Thereafter, northwesterly flow aloft should resume. August will return to more near normal values temperature wise, but the still warm west-central Atlantic implicates a higher dew point predilection. 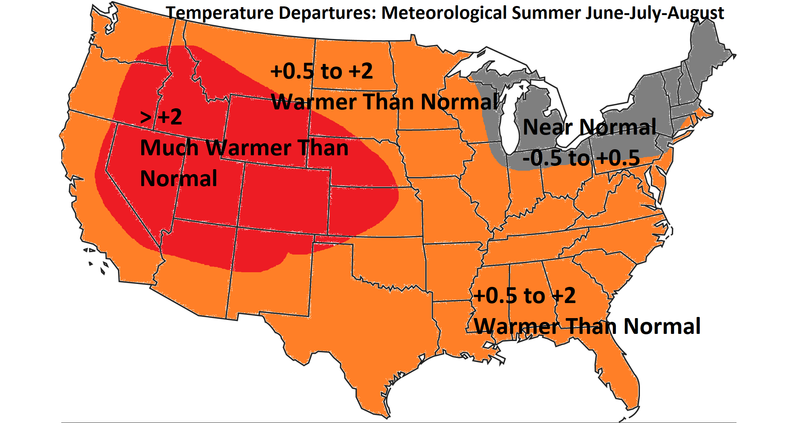 Overall, early, and later summer should feature the coolest readings relative to normal, with a strong heat burst sometime in the second half of June and/or in July. Hurricane Outlook: Named storms – around 10; Hurricanes – around 5; Major Hurricanes – 1 to 2; Impact – greater than normal potential in South Texas, Florida, and the Southeast US Coastline. Thus, it is reasonable to state that, overall (for most locations) temperature departures for summer 2018 fell between approximately +1.0 and +2.0. My temperature departure map indicated +0.5 to +2 departures for the coastal Northeast, although specific numbers provided for NYC were 0 to +1. Therefore, while the warmer than idea verified, the heat was slightly greater in magnitude than anticipated. The progression for June and July verified very well: cool –> hot. However, August was the most aberrant deviation from the forecasted progression, although, higher dew points were correctly prognosticated throughout the summer. 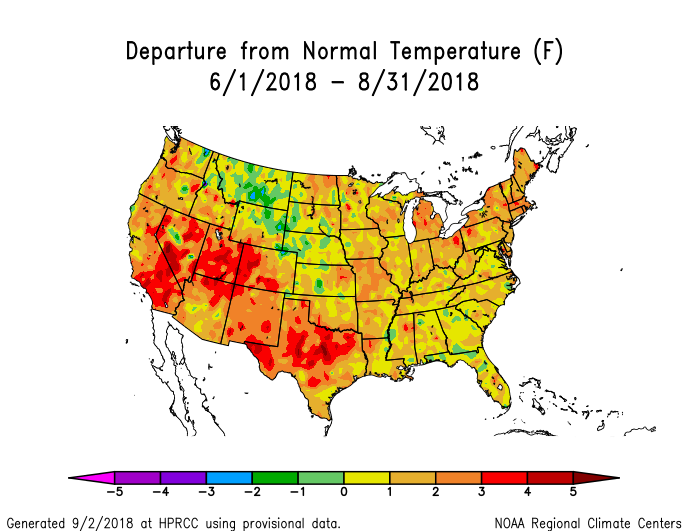 For the nation as a whole, temperature departures were mostly correct / within range, with the most robust warmth relative to normal in the SW US as expected. 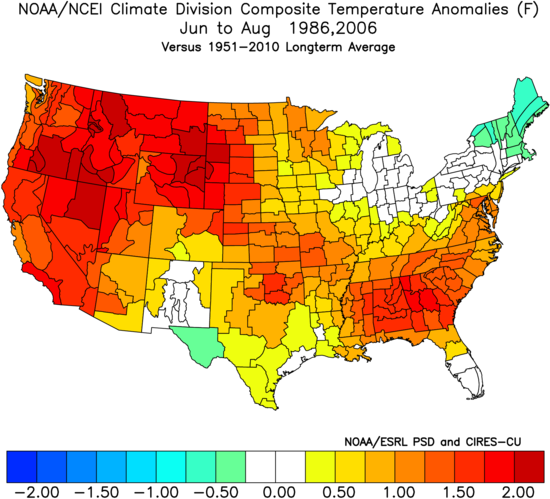 The primary flaw was the near-normal area forecasted in the Great Lakes/interior Northeast. 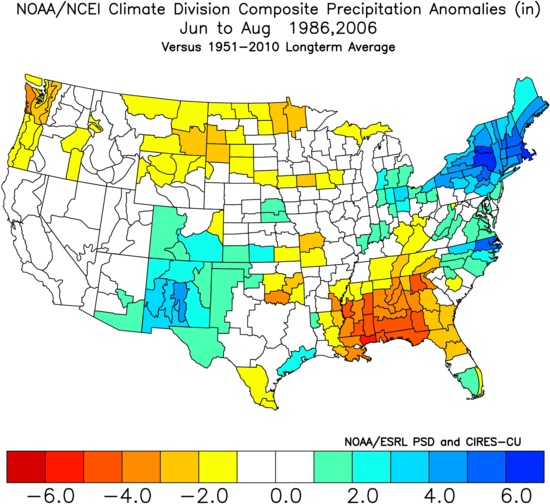 Regarding precipitation, rainfall was above to well above normal in the Mid-Atlantic and Northeast, as anticipated. 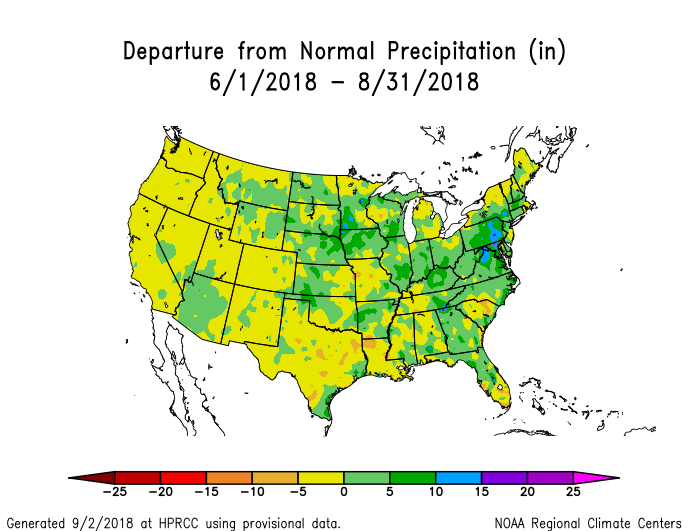 Most of the rest of the country was closer to normal or drier than normal, although, portions of the Mid-west/Ohio Valley were wetter than expected. Overall, nation-wide, this was a great forecast, and locally, a good to very good forecast, with the principal flaw being a slight underestimation in the magnitude of the heat, especially for the month of August. 90 degree days, forecasted to be 18-25, should have been forecasted as 20-30; however, the range will be close for most locations. I conclude that this summer 2018 forecast verified with a grade of B.